One of the joys of working with vintage guitars (and talking with JGG customers) is that you often discover some great guitar players and recordings. 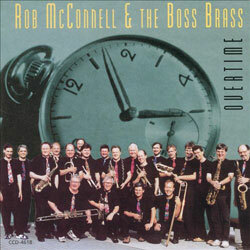 One such recording is an album called ‘Overtime’ by trombonist Rob McConnell and the Boss Brass from 1994. This album features the guitar playing talents of Ed Bickert, who turns in a stellar performance throughout the recording. 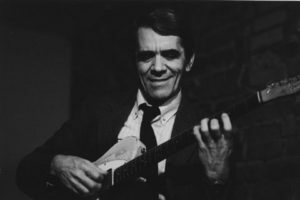 Ed Bickert who has for years favoured a worn blond Fender Telecaster as his instrument of choice is a Canadian jazz guitarist par excellence, who has had a long career working with artists such as Paul Desmond, Don Thompson and of course Rob McConnell. Bickert’s style is highly refined with a very carefully developed harmonic sense. His accompaniment skills are legendary, which probably explains why he was also a well known studio guitar player in Canada for many years. On ‘Overtime’ there are many wonderful musical moments, but one track really stood out for us – ‘Alone Together’. This famous jazz standard has been recorded by a number of well known jazz guitarists, but it is the combination of Bickert’s guitar and McConnell’s trombone that is particularly noteworthy here. There have been many famous instrumental pairings in jazz which have featured guitar and on this recording you can hear just how effective Bickert’s Telecaster is alongside the warm, rich tone of the trombone. Check out the excerpt clip below to hear the real magic created by these two musicians, playing at the top of their game. What’s your favourite instrumental pairing with guitar?..let us know.